Vermont Power of Attorney Forms are instrumental for anyone who intends to deliver his or her authority to another individual in one or more matters. There are many types of situations and circumstances where a POA would be useful, therefore different forms will address different needs. It will be up to you, as the principal, to ultimately determine the level of authority you would allow your agent access to when acting on your behalf. Additionally, you will need to decide when such authority should be delivered, remain in effect, and terminate. These considerations as well as who you choose as to represent you should only be determined after you have developed a deliberate plan and obtained advice from an impartial and qualified professional. Advance Directive for Health Care (Medical POA) – This document can be used to appoint another to handle your health care matters in the event you no longer can communicate your wished to your doctors. Durable (Financial) Power of Attorney – This may be used to appoint another to handle your financial matters over an extended period of time. Even if you get to the point where you can no longer make decisions for yourself, this form will continue to be in effect. General (Financial) Power of Attorney – This is like the durable form, because it allows you to appoint another to handle your financial affairs over a period of time, however, if you become incapacitated it terminates and is of no further effect. 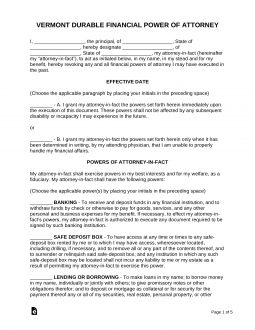 Limited (Springing) Power of Attorney – This form is when you are seeking representation for more limited situations, however, it requires you to specify when and how you wish your agent to act. Minor (Child) Power of Attorney – For the use of a parent that would like to elect another individual to handle the basic needs of their child in regards to education, everyday well-being, and medical needs. Signing Requirement: Must be signed in the presence of a notary public. Additionally, it is suggested that one (1) or more subscribing witnesses be present at the time of execution. Real Estate Power of Attorney – Allows another person to handle the conveyance of real property in accordance with 27 V.S.A. § 305. Revocation of Power of Attorney – This type is for canceling a POA you had already entered into. However, just filling this out and signing it is not enough – it is important that you provide copies of the revocation to your agents and other institutions using your old POA. Signing Requirement: No specific requirements but it is recommended to have the form signed by a notary public. Tax Power of Attorney (Form PA-1) -This form is for use in the event that you have a tax issue for which you want to appoint a tax professional to handle. Vehicle Power of Attorney – This form is for use when you seek to have someone else handle your titling and registration of your motor vehicle.